7-8 Ounce fresh Frozen Maine Tail coupled with a 6 ounce Gold Label Filet Mignon trimmed to perfection. This Filet is amazing, and is a class of its own. This Surf & Turf order comes with one 6 oz. 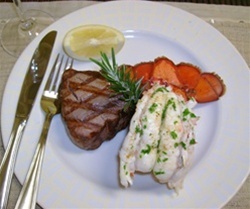 gold label filet mignon trimmed to perfection and one 7-8 oz Maine lobster tail .